One of Japan's traditional grilling dishes. 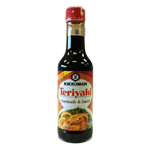 A delicious blend of naturally brewed Kikkoman Soy Sauce, Mirin and other ingredients will allow you to enjoy authentic Japanese Teriyaki dishes at home. Adds authentic wonderful flavour and tendernesss to seafood, meat and poultry. A soy sauce based teriyaki sauce is coated onto fish or chicken ingredients then grilled, with a final coat of teriyaki sauce being applied before serving.